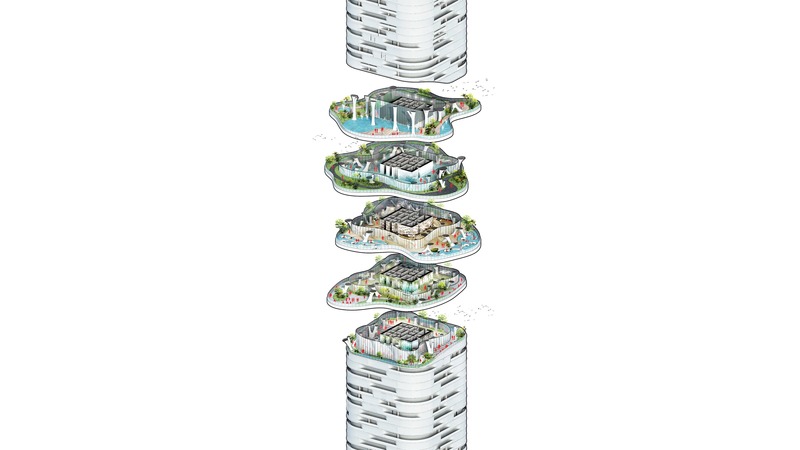 Nature burst into spiraling heights with landscaped high-rise ensemble for Vietnams next generation. 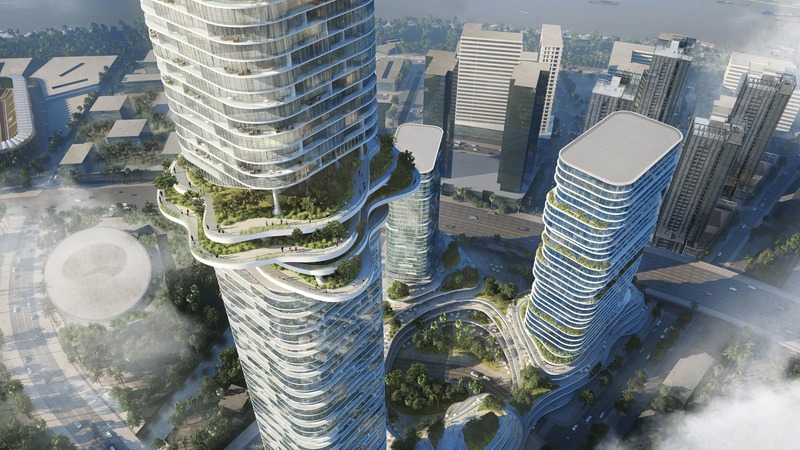 Empire City, a spectacular ensemble of high-rise towers and public spaces, marks Büro Ole Scheeren’s expansion into Vietnam. It is set to become a new focal point of Ho Chi Minh City, sculpting a symbiotic vision of nature and living within the space of the city. 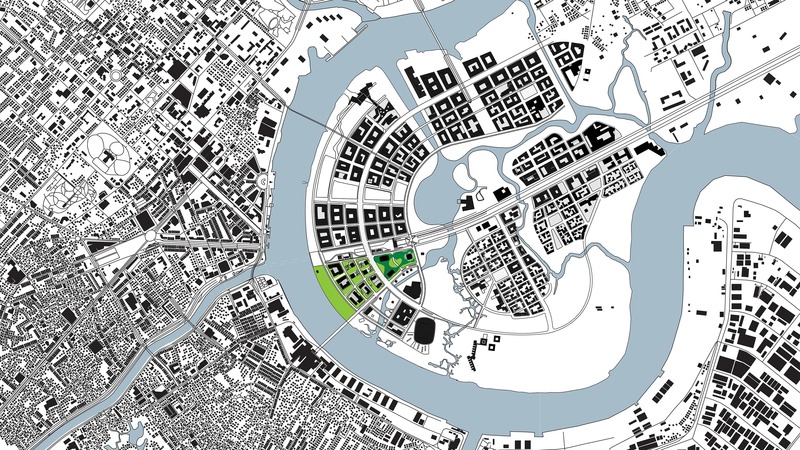 Situated on a central peninsula of the Saigon River, the project will generate an integrative environment that fuses natural landscape with the rapidly growing metropolis. As a result, new qualities of urban living will emerge in this mixed-use environment of work, life, culture, entertainment and public enjoyment. 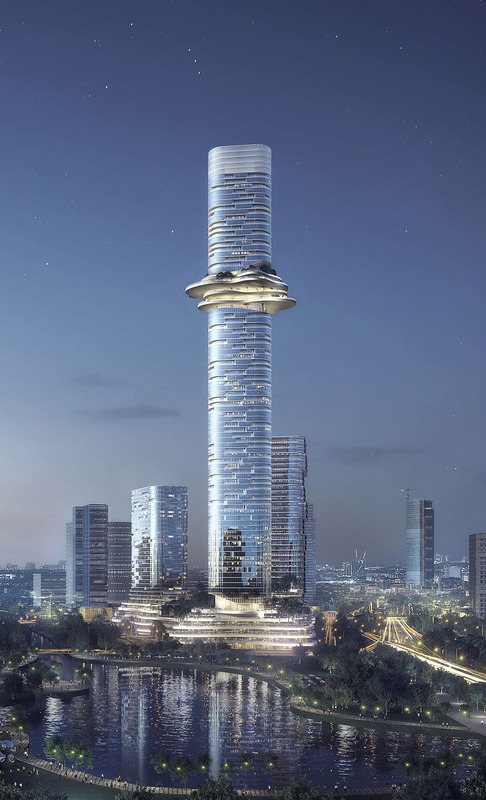 Three skyscrapers will soar above a mountain-shaped, garden-like podium, with the central Empire 88 Tower reaching a height of 333 meters. Its 88 floors will encompass residences, apartments, a hotel and a public observation deck. 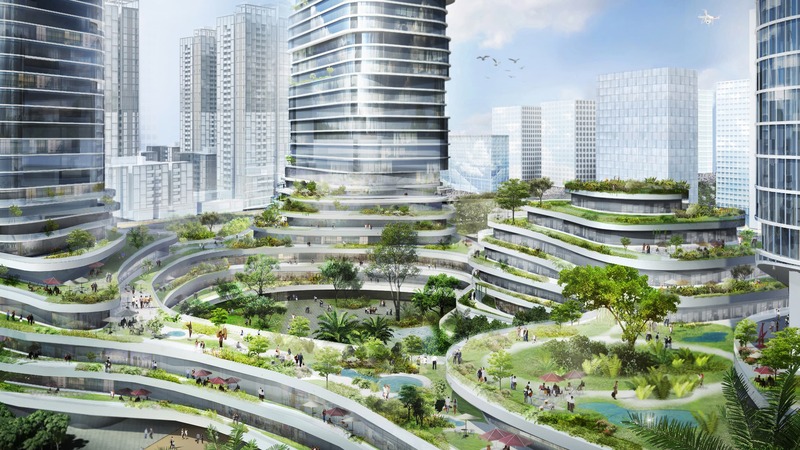 Breaking open the shaft of the tower and projecting vertical gardens at towering heights, the expressively undulating platforms of the “Sky Forest” will elevate the podium’s urban landscape into the sky. 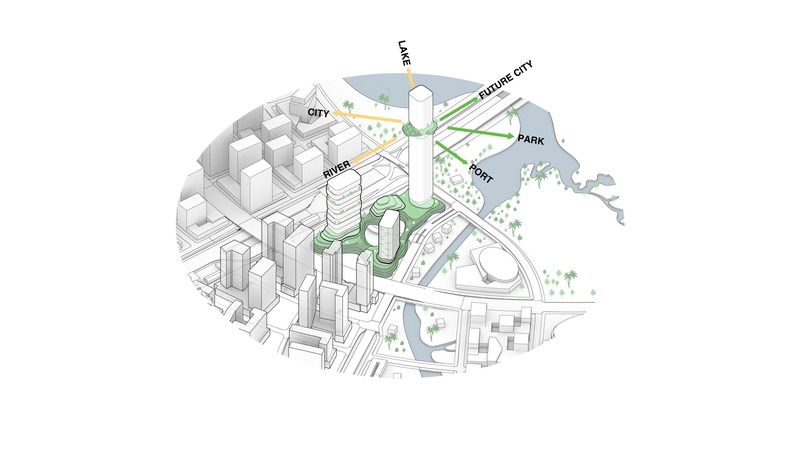 Hovering terraces will cantilever in manifold directions around the tower’s central axis, reaching out into the urban context and the peninsula’s natural surroundings as a gesture of reconciliation between the city and the countryside. The “Sky Forest”, with its alluring interplay of interior and exterior, will create a magical journey through Vietnam’s tropical landscape. 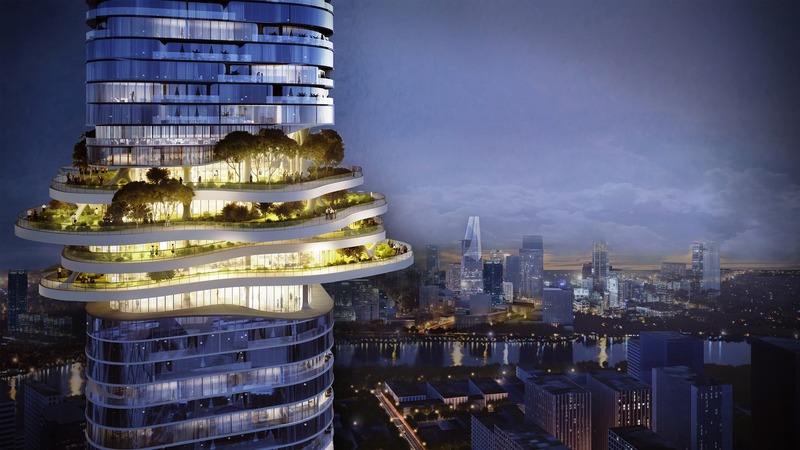 Densely populated with a variety of local plant species and water features, the multi-level experience will give breathtaking views across Ho Chi Minh City and the Saigon River, accessible to the tower’s residents and the public alike. At the very top of the landmark tower, the “Cloud Space” will complete the vertical journey and stage a public arena with flexible possibilities for events and recreational activities, celebrating the glistening views of the bustling metropolis. 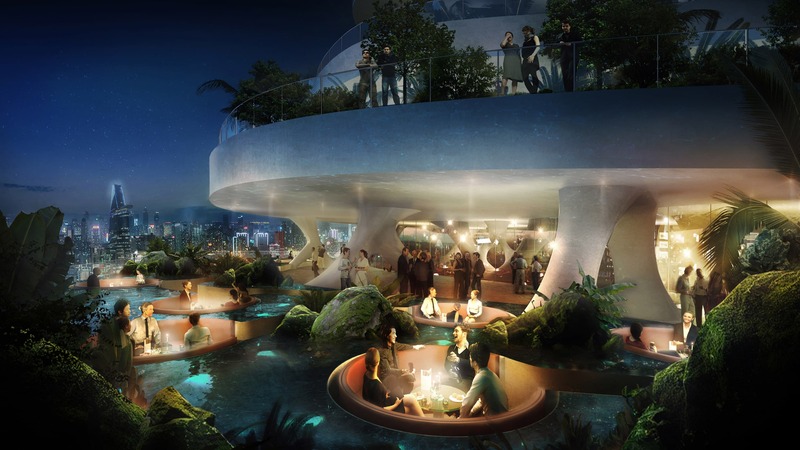 The podium will echo Vietnam’s mesmerizing landscape, with its poetic soft hills and cultivated terraced rice fields, and will anchor the tower ensemble to the ground. A variety of layered, open spaces will engage the public in a multitude of experiences throughout this grand urban garden. 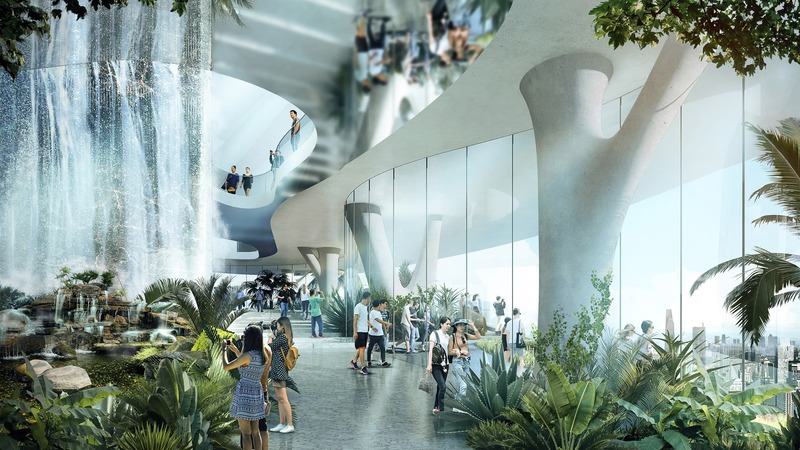 An extensive network of public activities will be threaded throughout the modulated structure, connecting commercial areas with recreational environments. Custom-designed co-working spaces will be integrated into multiple floors of this terraced foundation and engage the collaborative spirit of Ho Chi Minh City’s vibrant startup culture. 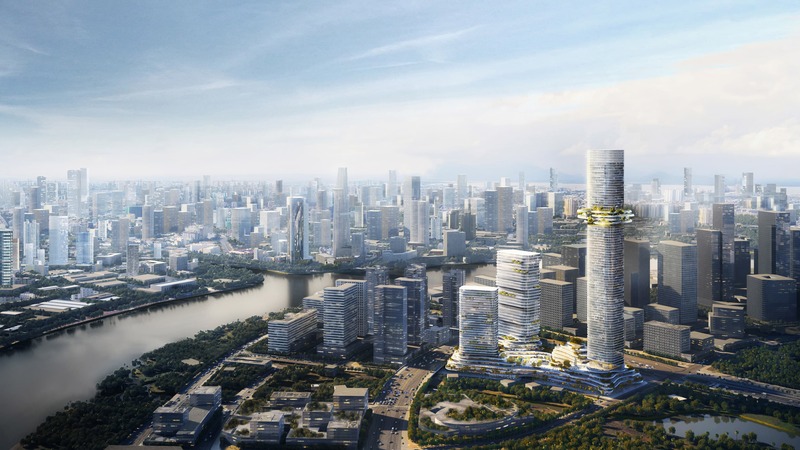 In addition to the soaring landmark tower, two accompanying high-rises will comprise more traditional office typologies and residential spaces atop the landscape podium. 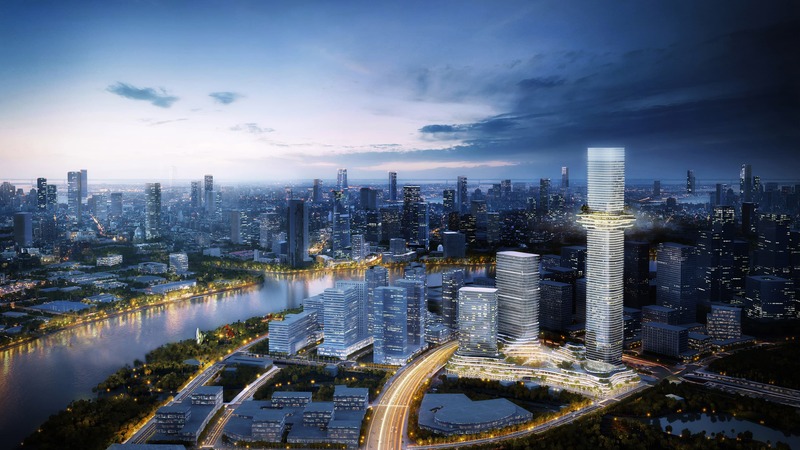 The project is developed by Empire City Limited Liability Company, a multi-national joint venture of prominent names in real estate development in Vietnam, Singapore and Hong Kong – Tien Phuoc Real Estate JSC, Keppel Land Ltd., Gaw Capital Partners and Tran Thai Lands Co., Ltd.